Is Volusion the Best Ecommerce Solution Out There? Volusion offers an intuitive solution to building an online storefront. Their 24 hour support, combined with easy to understand video tutorials and a simple front end editor make them an easy choice for new business owners. Volusion comes with about seventy five free templates to help you design your store. Although this doesn’t seem like a lot, the themes are well designed and it’s more than many of their competitors offer. So this would be more than enough to get you started until you're ready to purchase on of their premium templates. Templates can be chosen by category depending on your business. They offer categories like apparel, automotive, jewelry, sports, business and lots more. You can even select them by color, price and season. All together Volusion offers about 500 templates ranging anywhere from free, to $895. Another great feature is the ability to take phone orders. Sometimes customers need a little help completing orders online – with Volusion’s phone order feature you can easily walk them through the process, or complete the purchase for them. The ability to track customers purchase paths in real time makes phone assisted purchases possible. This is not a standard feature offered by most storefront builders. With many storefront builders, optimizing content like articles is difficult, or impossible. Volusion has implemented a standard SEO editor into their system that works like many of the popular WordPress plugins. This makes optimization easy to access, easy to use and easy to edit. 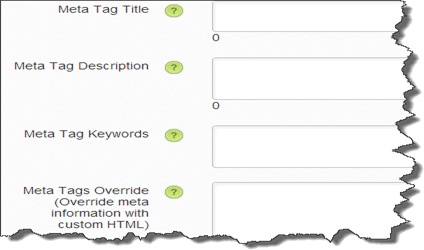 Labeled text fields make optimizing content much more simple than other Ecommerce builders. Volusion like many others, offers a mobile ready solution for the website you build. This is becoming more and more common with the rise of handheld devices. However, most other storefront builders just shrink the existing template to fit better on mobile screens. 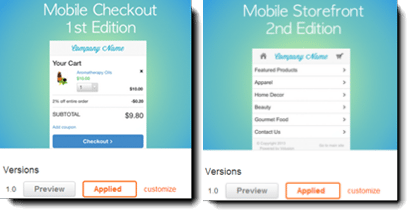 With Volusion, you actually get an entirely new template to completely customize the experience for mobile customers. This seemingly ‘small thing’ can have dramatic affects on your conversion rates optimization. These are the two standard mobile templates. Both are completely customizable and easy to use. One of Volusion’s greatest features is also it’s biggest downfall. Volusion’s uncanny ability to create an almost seamless front end editor causes a few issues when making changes to existing content and products. Because things can be added or adjusted from the frontend, locating specific products, images, or any other part of your store can be a bit of a pain in the backend. For example, locating an article you wrote last month would require you to scroll through everything you did after you wrote it. There is no search feature to help you find things on the backend and this is a major problem. Scrolling through pages like this is necessary for making changes to older content within your store. While you can use the front end editor for most things, locating a redirected URL will be a time consuming task as you cannot locate something like that from the front end. Unfortunately, during the optimization tutorial Volusion offered some bad advice about keywords. In the optimization tutorial they advise you to choose about twenty five keywords, “because search engines use these to index and rank your website”. This is terrible advice for a couple reasons. 1.) Google no longer uses keywords as a ranking factor. Although Google isn’t the only search engine, they are number one. For many storefront builders, a guided walkthrough explaining how things work has become standard. Typically, a representative from the company calls you by phone or skype video and gives you a truly guided tour. Volusion did not do this, although they did offer a self guided tour that explained some of the basic functions. The self guided tour left me confused and a little underwhelmed. Had I not wanted to write this review I would not have continued on to the free trial. I feel like they could do a better job explaining things here. It would be just as beneficial for them as it would the customer. Put simply, ease of use. Volusion might be the most simple storefront builder I’ve ever come across. Often though with simplicity, website builders of any kind lose functionality or lack features. For the most part, that is not the case with Volusion. Volusion is an online storefront website builder for individuals looking to start an ecommerce business with very little technical ability. It is designed to help you quickly create a great looking store where you can sell physical products online. If you own a physical business that needs to expand, Volusion's ecommerce builder is for you. This ecommerce platform is one of my Top 3 choices! The other two are Big Commerce (92/100) and Shopify (91/100). They both have different features, so check them out and see which one fits your goals best. If you don’t already own a business in the real world, then Volusion is not going to help you. Website solutions like Volusion are for people selling physical products they already own. Do you own, or have you created any products? If not, that doesn’t mean you can’t set up a store online and sell things. In fact, you can sell more products more often – and with a lot less hassle and expense. That’s right! See, companies that use things like Volusion are looking for people to help them sell their products. They create the product, handle overhead and make sure things are shipped and stored properly (among other things). They don’t have time to sell. Instead they use affiliates to help them. Visit any store online and you will see, somewhere on the front page, a tab that says, “Affiliates”. That means you can sign up for free to sell their products. You can do this with any product online. So why go through all the trouble of setting up a physical business? You can start your own affiliate website for about $10 a year. All you need now is to learn how. There’s no overhead, no shipping, no storage and no cost to get access to thousands of products from other companies that you can promote and make money from, right on your own .com website! I think I like Shopify better. They’re like the Wealthy Affiliate of eCommerce in my opinion. Awesome Jay….the Shopify review is coming here! PS, for anyone that doesn’t know, Wealthy Affiliate is the best internet marketing training center for affiliate marketers. It’s linked above in the reviews.